Who's ready for a vacation? Here at schuh we've got your footwear covered as the Parade II sandal arrives for the new season. 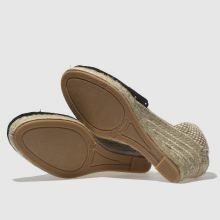 The 6cm wedge boasts a black crochet fabric upper with a woven heel support, ribbon ankle lacing and a rope adorned midsole.